Hospital and Healthcare Security, Fourth edition, is a complete resource for healthcare protection planning and programming. 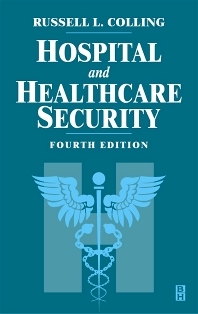 The book offers thorough and fully updated coverage of the primary health and security issues hospitals and healthcare agencies face including infant protection and security, animal and research laboratory security, hospital watch programs, and the relationship between hospital security and law enforcement.<BR id="CRLF"><BR id="CRLF">Written primarily for use by the healthcare protection administrator, it also serves as a reference for any hospital security officer, supervisor or administrator. This book presents a complex and diverse security focus in a readable and understandable format. Covers the latest security guidelines for adherence to the Joint Commission on Accreditation of Healthcare Organizations. Updated edition includes information for all forms of health care service including: assisted living, home care, skilled care, accute care, and outpatient services for local, state, and federal facilities. Contains all the information needed to start and run a fully-operational health care security department. Tony W. York, CPP, CHPA, has over twenty years’ experience administering healthcare security programs and is chief operating officer for HSS Inc., a specialized security firm based in Denver. York, who is board certified in security management, holds the Certified Protection Professional (CPP) designation and the Certified Healthcare Protection Administrator (CHPA) designation. A past president and board chair of the International Association for Healthcare Security & Safety (IAHSS), York chairs the Council on Guidelines. This council produces the Healthcare Security Industry Guidelines and Healthcare Security Design Guidelines. A regular contributor to the advancement of the healthcare security field, York is recognized internationally as an industry expert and is a frequent lecturer and author on healthcare security and leadership. A native of North Carolina, he earned a B.S. degree in Criminal Justice from Appalachian State University, an M.S. in Loss Prevention & Safety from Eastern Kentucky University, and an MBA from the University of Denver. Russell L. Colling, CPP, CHPA, M.S. Security Management - Michigan State, has worked for over 40 years in healthcare administration and healthcare security management and is also the founding president of the International Association for Healthcare Security and Safety (IAHSS). Mr. Colling was formerly the Executive Vice President of Security Services at Hospital Shared Services of Colorado. He has authored two books with the Joint Commission for Accreditation of Healthcare Organizations (JCAHO) and also has extensive experience in security litigation cases.